The temporary internet files in Internet Explorer 11, sometimes called the cache, are the copies of text, images, videos, and other data from recently viewed websites that are stored on your hard drive. Though they're called "temporary" files, they remain on the computer until they expire, the cache becomes full, or you remove them manually. As far as troubleshooting a problem goes, deleting temporary internet files is helpful when a web page won't load but you're pretty confident that the site works for others. Deleting the temporary internet files in Internet Explorer is safe and won't remove other things like cookies, passwords, etc.. Follow the easy steps below to clear the cache in Internet Explorer 11. It takes less than a minute! Deleting the temporary files stored by IE is not the same as removing Windows tmp files. That procedure is appropriate for deleting data left over by programs not specific to IE, like third-party installers. The Ctrl-Shift-Del keyboard shortcut works too. Just hold down both the Ctrl and Shift keys and then press the Del key. Click the Delete button at the bottom of the window. The Delete Browsing History window will disappear and you might notice your mouse icon go busy for a few moments. As soon as your cursor returns to normal, or you notice the "finished deleting" message at the bottom of the screen, consider your temporary internet files deleted. Older Internet Explorer versions, like IE10, IE9, and IE8, have similar procedures for clearing the cache but please try to run the latest version of IE if you can. Check out our Internet Browser How-Tos for more about Internet Explorer, as well as other browsers like Firefox, Chrome, and Safari. By default, Internet Explorer stores temporary internet files in this folder: %LocalAppData%\Microsoft\Windows\INetCache\. You can, however, change this folder location at will. You could avoid clearing the cache in IE manually be using a program that does it for you. One of the most popular system cleaners is CCleaner. Just make sure the "Temporary Internet Files" option is chosen under the Internet Explorer area of the Cleaner section. 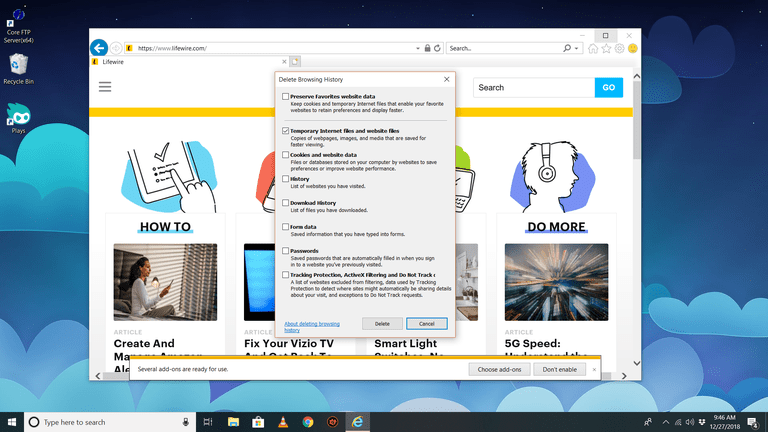 If you would like to delete other Internet Explorer data like any cookies, browsing or download history, form data, passwords, etc., go ahead and put a check in the box next to that option while in Step 3. IE's temporary internet files settings can be changed through Internet Options. Enter the inetcpl.cpl command in the Run dialog box (WIN-R keyboard shortcut) and then go into the Website Data Settings window through the General tab and then the Settings button. In there is where you can choose a maximum size of the cache. You can also force IE to check for new website data and avoid the cache, every time you visit the page, every time you use IE, automatically (the default option), or never. It might seem strange for the browser to keep a hold of this content for storing it offline. Since it takes up so much disk space, and it's a common practice to remove these temporary files, you might wonder why Internet Explorer even uses them. The idea behind temporary internet files is so that you can access the same content again without having to load them from the website. If they're stored on your computer, the browser can pull up that data instead of downloading it again, which saves not only on bandwidth but also page loading times. What ends up happening is that only the new content from the page is downloaded, while the rest that's been unchanged, is pulled from the hard drive. Besides better performance, temporary internet files are also used by some agencies to collect forensic evidence of someone's browsing activities. If the content remains on the hard drive (i.e. if it hasn't been cleared away), the data can be used as evidence that someone accessed a particular website.